The trade show floor at CTIA is packed with cell phone add-ons of various sorts, with hundreds of Bluetooth options. Of all the Bluetooth devices, the Vosser Bluetooth Rearview Mirror takes the prize for being the most unique and potentially the most useful (although there are several competitors in this space). It's both a rearview mirror and a cell phone speaker phone, which is where Bluetooth comes in. Power is supplied either by connecting to your cigarette lighter or through an add-on battery pack with hours of standby time. The mirror sits over your existing rearview mirror, making installation easy while maintaining portability to any car. 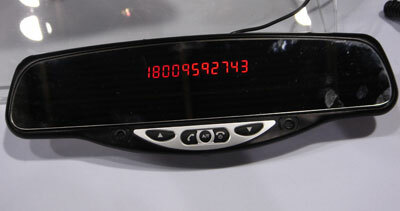 Caller ID for inbound calls displays on the mirror, keeping your eyes focused on a common driving area.